Madison Advisors provides both research and consulting services to enterprise clients in the communications management, digital communications delivery, and print markets. Its latest report, “CCM (News - Alert) Hosted Managed Services: Changing the Paradigm in Customer Communications Management,” focuses on customer communications management (CCM) and provides readers with a look at hosted managed services (HMS), which it believes can help businesses reduce the strain on managing their communications infrastructures. That service allows enterprises to offload their communications infrastructure to third parties. Those other parties, which host their own services in the cloud, manage the distribution of an enterprise’s calls. Madison makes it clear that CCM HMS is not equivalent to software-as-a-service. Instead, it may be understood as more of a service-as-a-service. HMS may come alongside the actual cloud-based software that businesses use to make calls, but it will be on the shoulders of the service provider to handle deployment of the communications system, integration of that system with existing business software, and support to enterprise IT as businesses move forward with that cloud-based material. Stephanie Pieruccini, the vice president of research and enterprise & technology consulting services at Madison, commented that the research shows businesses to be overwhelmed by the responsibility of handling both communications infrastructure and customer engagement. 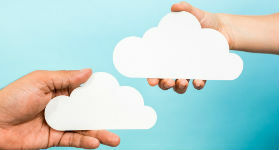 Moving that responsibility into the cloud could help businesses lighten their own essential daily duties. This can free them to concentrate on connecting with customers through any number of channels they may support. It is no secret that consumers are more demanding than ever when it comes to their preferences. With that in mind, anything that can help enterprises keep their connections with customers comes as good news. Madison predicts that the HMS market will continue to grow throughout the coming years. It expects that businesses will continue feel the weight of handling of their own infrastructure and will have a number of new service providers to seek as they reach the point of finding somewhere to hand off their burden.